The Draeger PAS Airpack 1 is designed for more heavy duty applications and is ideal for extended duration use in situations like toxic spills, chemical tank cleaning operations, or on offshore operations. These units are designed to supply the user with a constant uninterrupted flow of breathing air while being mounted either singly or in a pair (or 2 pairs) mounted on a trolley. This allows the user to work in a hazardous environment for longer periods of time while only wearing a lightweight breathing harness such as the Drager PAS colt. This allows the user/s to work for longer periods of time without suffering fatigue or stress caused by the weight and encumbrance of wearing a heavy air cylinder. Also it means the cylinders can be positioned in a safe zone while feeding the user/s breathable air via a reel-mounted hose. Another great feature is an incorporated safety relief valve along with a safety protective plate mounted over the pressure reducer, this kind of safety feature is an example of Draeger's commitment to user safety in the field. 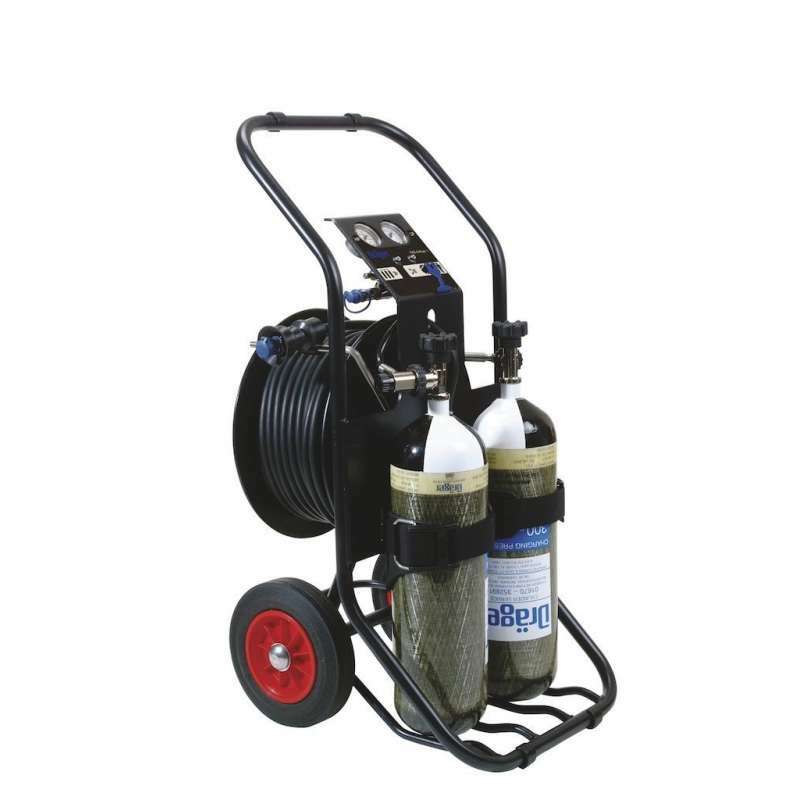 This highly flexible and well thought out system can work with up to 4 cylinders of a capacity of up to 12 litres, it includes a 50m hose which can be extended to 100m. The frame is constructed from durable polymer coated steel, which offers anti static and corrosion protection, has stainless steel fittings and a well protected hose reel cover and braking system to avoid snagging or entanglement when reeling in or out.